Winner of the December giveaway! Well well well, it appears that we speak the same language – food. Last month I asked you to tell me your favourite food and the floodgates opened! Boy do you like to talk food! This must be why we get along so well, I’m always happy to talk food. I received recipes and photos (hey! no calories in photos!) and oodles of delicious comments. Definite winner for favourite holiday food was stuffing in all sorts of varieties. Second favourite food are shortbread cookies. Cookies in general were high on the favourite list, gingerbread came in second. Also high on the favourites list were leftovers. Ummmm turkey, mashed potatoes, stuffing and gravy. Followed by more cookies of course. 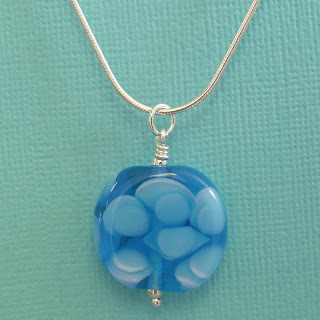 In a completely random draw (using random.org) the winner of the December giveaway of a Sky Blue Bubble Pendant is Jackie Barwin in Ottawa. Jackie voted for crunch, freshly fired potato latkes for Chanukah, made with yukon gold potatoes. (Latkes are on my list of things to make, anyone care to send me a tried and true recipe? Jackie? Actually I should check the Smitten Kitchen – smittenkitchen.com – I’m sure I’ve seen latkes listed there). Congratulations Jackie, nice way to start the new year. And a nice pendant to brighten up a dull grey month. Enjoy!